서울, Seoul : Koreaone Press, 1994. This is the first Korean edition of Sacred Clowns. This edition was published in 1994 by Koreanone Press in Seoul, South Korea. 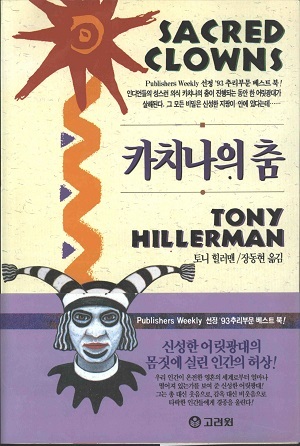 The text was translated from Tony Hillerman's original English to Korean by Dong-Hyun Jang. The cover art is not credited but depicts the Sacred Clown figure which is present on many covers from Sacred Clowns. Format: Paperback, 22.5 x15.1 cm. Binding: Full-color paper covers with the title, author and publisher's logo printed vertically on the spine.